GIS is used to find the best opportunities for tying producers to pipelines; to terminals; and, eventually, to retail gas stations. 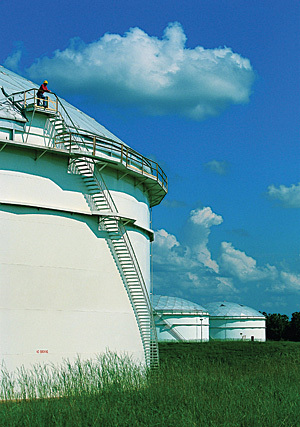 With ArcGIS software, Colonial can identify infrastructure locations incompatible with ethanol. Spatial queries identify which ethanol producers connect to railroads, then in turn connect to Colonial's pipelines. Amid the clamor of national debate over how best to reduce reliance on oil, the call to replace petroleum with ethanol made enough noise to attract government and industry attention. This screen shot shows some current pipeline routes with topology. A federal mandate, passed in December 2007, requires that the United States produce 15 billion gallons of corn-based ethanol by 2015. In response, a major U.S. pipeline company, Georgia-based Colonial Pipeline Company, began its study of the feasibility of introducing alternative fuels, such as ethanol, to pipeline shipments. "Ethanol is now transported on railways and roads, but there is growing interest in the use of pipelines," says Chad Zamarin, who spent eight years in the natural gas industry working on new pipeline construction, failure investigation, and pipeline integrity management before joining Colonial in 2004. "We want to be able to safely ship any and all types of fuel." Colonial has been in the pipeline business for 45 years and delivers a daily average of 100 million gallons of different fuels to markets across the southern and eastern United States. The company's 5,500-mile network of underground pipelines extends from Houston, Texas, to the New York harbor and carries gasoline, home heating oil, aviation fuel, and other refined petroleum products. Even for a company with as much experience and infrastructure as Colonial, the task of shipping ethanol brings new concerns that must be addressed, such as protection of the steel pipe and the integrity of the fuel being shipped. Despite obstacles, Colonial is pushing ahead with system integrity and business case studies for carrying alternative fuels, including biofuels. The efficiency of pipeline distribution makes new cross-country lines a viable investment. "We are moving in the direction of alternative fuels because we want to be ready to ship not only the fuels of today but also the emerging and still unknown fuels of tomorrow," Zamarin says. "Pipelines are by far the safest, most reliable, and most efficient mode of transportation. We are trying to figure out how to use our infrastructure and technology to address the nation's energy needs." "The first step in addressing the ethanol issue was to perform an analysis of our existing pipeline system to see if we are capable of shipping ethanol," Zamarin explains. Colonial and other pipeline industry experts have learned that ethanol is not directly compatible with existing systems. Ethanol is water soluble and prone to absorbing moisture that may accumulate in a pipeline. The addition of water to ethanol can render the ethanol unusable as fuel. Additionally, ethanol differs from petroleum-based fuels in that in the presence of certain impurities it can potentially cause cracking of steel pipelines. Ethanol can also have a damaging effect on a steel pipeline's equipment and seals. A second consideration to the idea of shipping ethanol through existing pipelines is location. Ethanol production centers are mostly in the Midwestfar from consumers and not in direct reach of many existing pipelines. Ethanol would still have to be shipped to a pipeline injection facility by train, barge, or truck. Zamarin says that the biofuels industry faces many complex issues that revolve around geospatial questions. In today's complex regulatory and operational environment, GIS is an important asset to help effectively manage a pipeline system. To manage the large and growing number of contingencies and considerations, Colonial uses GIS technology. 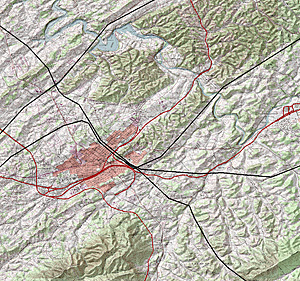 GIS software by Esri was selected because it provides a framework for understanding every element of a particular situation based on geographic location and relationships. In the pipeline industry, GIS is used to find the best opportunities for tying producers to pipelines, to terminals and, eventually, to retail gas stations. 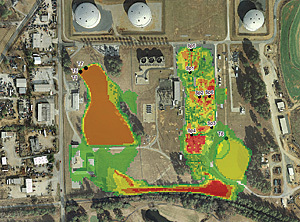 This image of a refinery incorporates spatial analysis for detailed planning purposes. Using GIS, pipeline companies layer infrastructure data with natural resources and population information. For Colonial, GIS provides an integrated account of the company's assets and infrastructure. The system tracks the location of pipelines, tanks, equipment, and other components. With the modern geospatial tools found in ArcGIS software, Colonial can analyze its infrastructure to quickly identify locations that may not be compatible with ethanol. 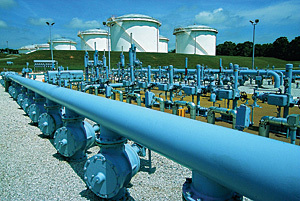 By building a computer model of proposed plans, Colonial is able to identify risks and analyze the use or modification of its pipeline system. Working with GIS technology, Colonial has been able to build business models for shipping ethanol via pipelines. Within the business model, Colonial can weigh the costs associated with various railroads, production capacity for each ethanol plant, and various transit times from producer to pipeline. Colonial engineers map and model possible scenarios of transporting ethanol from producer to train, barge, or truck to pipeline to terminals and back to trucks. Concurrently, the company can analyze population data within the GIS to determine where the greatest demand for ethanol exists. "If I want to know what ethanol producers are closest to Colonial pipelines or what railway systems connect us," Zamarin says, "I'd have to use a lot of maps and I still might not figure out which combination of producer and railroad is best. "When we put all the information into the GIS. we solved the tedious process of shuffling through paper maps and relying on manual interpretation. Now, it has become an efficient process of spatial analysis. We run spatial queries to identify which ethanol producers connect to railroads and then in turn connect to our pipeline and integrate that analysis into our business models to identify the best opportunity." Colonial stores its data in an enterprise geodatabase based on the ArcGIS Pipeline Data Model (APDM) industry template. Data is stored in Oracle9i with ArcSDE 9.2. Integration, sharing, and analysis of the data are performed through ArcGIS Server and a suite of out-of-the-box applications from Esri and third-party business partners. For operations and project development, Colonial leverages a variety of purchased, publicly available, and company-collected and -owned data. While Colonial prepares to respond to the demand for biofuelsethanol or otherwisethe discussion of U.S. ethanol policy has intensified. For decades, the U.S. oil and natural gas industry has blended ethanol with petroleum to add octane and oxygen, which reduces certain kinds of fuel emissions. In 2007, U.S. farmers harvested a little more than 13 billion bushels of corn, according to reports by the United States Department of Agriculture (USDA). Before floods overran much of the Corn Belt, this year's projected yield was a record 14.6 billion bushels with 3.2 billion bushels designated for ethanol and 2.35 billion bushels for export. More recent estimates lower total projected yield to 11 billion bushels, while corn used for ethanol is expected to jump 30 percent. Meanwhile, as opportunities are emerging, pipeline companies such as Colonial have begun route selection and planning for new pipelines. Routing of new pipelines requires consideration for property owners, water bodies, environmental issues, impact to other utilities, types of vegetation, fault lines, and topography. 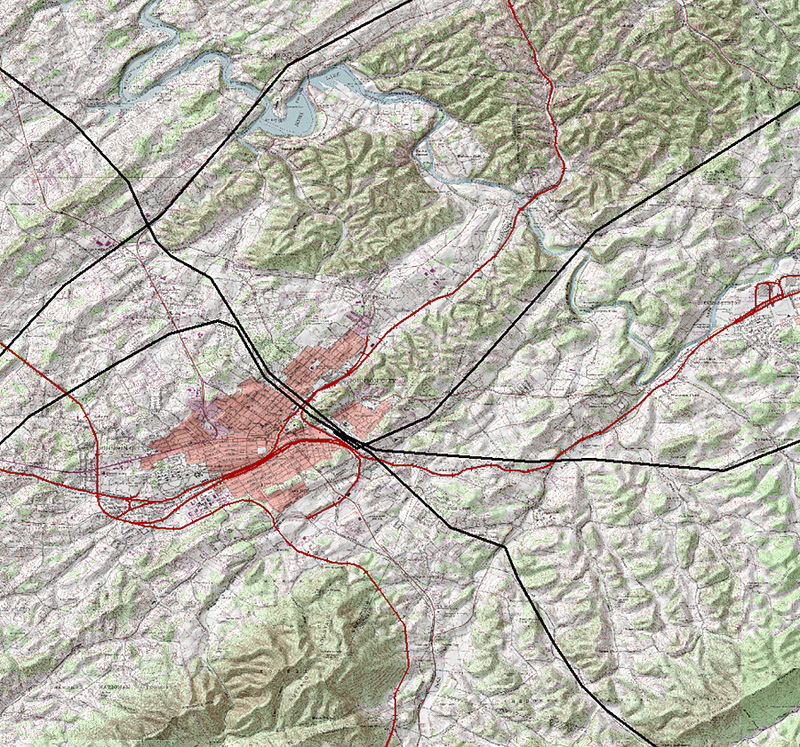 All this information can be represented as layers in a GIS. For more information, contact Chad Zamarin, Colonial Pipeline Company (e-mail: CZamarin@colpipe.com, tel. : 678-762-2280).